Triumph TT 650 Special: Decked out in the livery of the same motorcycle ridden by Steve McQueen in the 1963 Mirisch Film “The Great Escape”. This Triumph has been mechanically refurbished and carries all of the markings of McQueen’s bike including the Olive Drab paint, correct exhaust pipes, and even the correct WH-13371 license plate on the front fender. Records indicate that there were four motorcycles used on the set and it is not known if this is one of those. 1945 BSA M-21: The M20 series was a British motorcycle made by Birmingham Small Arms Company (BSA) at their factory in Small Heath, Birmingham. 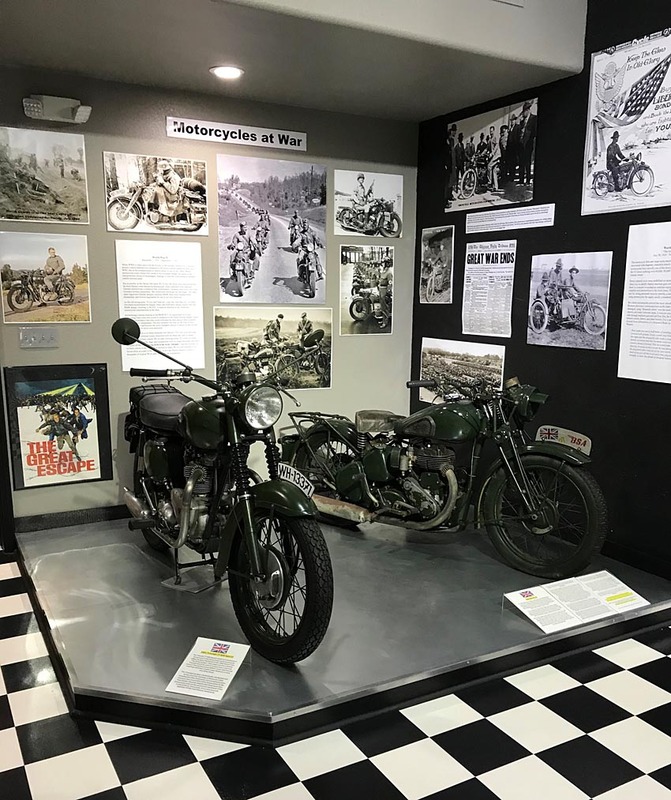 The M20 evolved into one of the longest serving motorcycles in the history of British military motorcycling, as well as becoming the most numerous type produced for World War II with 126,000 in active service. The M-21 BSA on display was initially purchased by Donald J Hunter, CW5 MIL USA ATEC while stationed in North Africa (Egypt) where he served as an attack helicopter pilot. The bike is original except for the Egyptian tires.